Washington, DC – In 2016, America experienced the largest attempt to expand abortion since the 1980s. 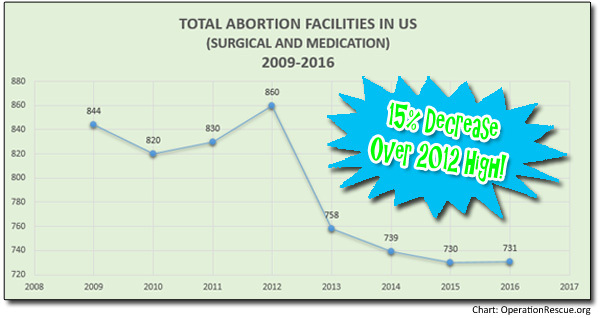 Despite the best efforts of the Abortion Cartel in a year of conditions that favored it, closures of abortion facilities compensated for the new opens, leaving the number of surgical abortion facilities the same as 2015. It was expected that the number of medication abortion facilities would dramatically increase after the Food and Drug Administration relaxed Mifepristone (RU 486) protocols in March, making it easier for abortion providers to dispense the abortion-inducing drugs. That anticipated increase never actually materialized. After a complex reorganization in services provided by Planned Parenthood facilities, Operation Rescue confirmed that there are now 214 medication abortion facilities, representing a net gain of only one facility over the past year. 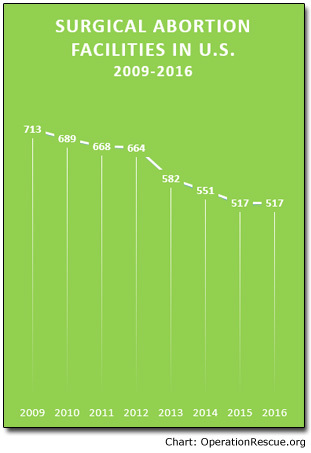 This gain of only one medication facility a negligible addition, and is far lower that the net increase of 25 medication clinics recorded in 2015. Part of that reorganization included converting many of its non-abortion “referral” clinics to medication abortion facilities. In 2016, 14 referral clinics began dispensing abortion drugs. Twenty Planned Parenthood facilities that offered only non-abortion services were permanently closed. When the music stopped on Planned Parenthood’s version of musical chairs, 7% of Planned Parenthood’s non-abortion clinics had closed. While Planned Parenthood is shuttering facilities that actually do provide some legitimate services in favor of those that can sell abortions, a new report by the Radiance Foundation shows that actual health services done at Planned Parenthood, such as breast cancer screenings, PAP tests, prenatal care, and even sexually transmitted disease treatments have dramatically decreased from 2010 through 2014. While non-abortion health services have decreased, abortions at Planned Parenthood have risen 12% between 2006-2014. Conservatively, abortions account for 80% of their “health services” income. 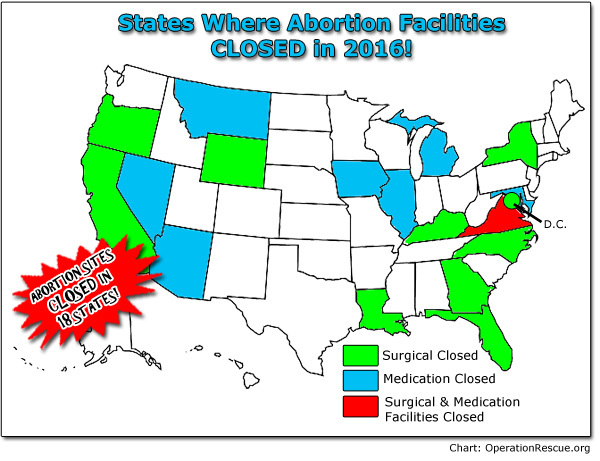 There were 19 surgical abortion facilities that completely closed or halted abortion services in 2016, while 12 medication abortion locations shut down. This makes a total of 31 abortion facilities that closed in 18 states since last year. Today, the total number of surgical and medication abortion facilities stands at 731. Operation Rescue meticulously surveys each abortion facility in the U.S. annually using a number of investigative methods. Each open facility was directly contacted, and voluntarily shared information for this survey, although they were not aware the information was going to Operation Rescue. “Operation Rescue’s annual surveys provide the most complete and accurate picture of abortion facilities available — straight from the horse’s mouth,” said Newman. •	The average cost of the most common first-trimester surgical abortions is $625.35, up 5% over last year. 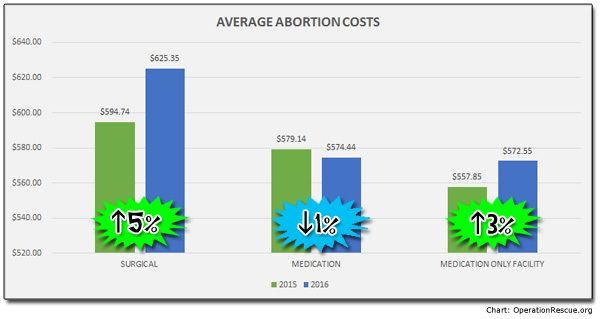 •	The average cost of medication abortions done at surgical facilities is $574.44, which represents a very small decrease of 1% below similar 2015 costs. 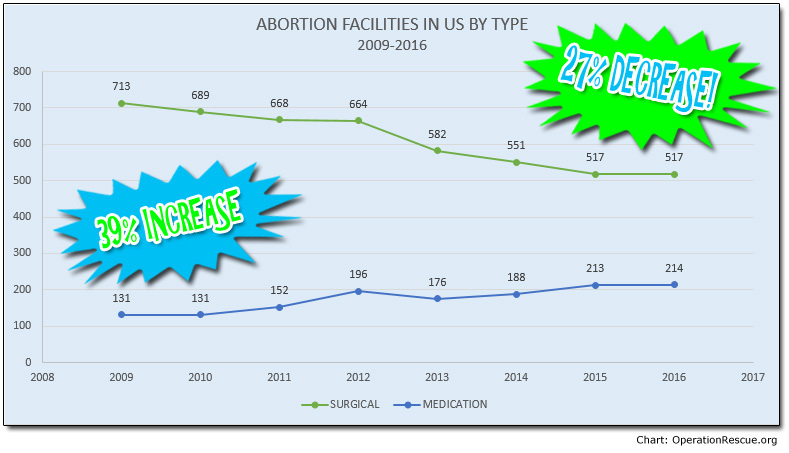 •	The average cost of medication abortions done at facilities that only offer that type of abortion is $572.55, up 3% over last year. However, there were two factors that should have resulted in a major decrease in the customer cost of abortion drugs. First, the FDA relaxed dispensing protocols, making it easier for facilities to prescribe abortion drugs. 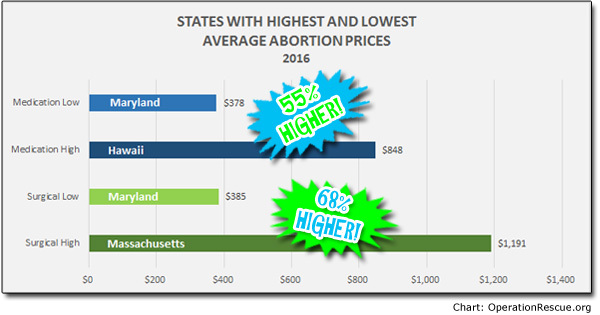 Costs were expected to fall, especially at medication abortion only facilities that do not generally have the same overhead costs as surgical facilities. That never happened. Instead, costs rose. Secondly, a new California state law that allows non-physicians to dispense abortion drugs went into effect in April. This should have significantly reduced the cost of medication abortions in that state since overhead costs of paying the more expensive licensed physicians would have been reduced. However, the average cost of a medication abortion in California is now $669.50, a whopping 13% increase over last year’s state average of $561.63. The current price for a medication abortion in California is a full 14% above the national average. Policies implemented by liberal politicians to reduce the cost of abortion pills and make it easier for abortion facilities to dispense them completely backfired – at least for women these policies were supposed to “help.” They have only served to increase those costs to women, making the abortion pill even less affordable. Meanwhile, abortion facilities have exploited this financial opportunity to increase their bottom lines at the expense of poor urban women of color that abortion facilities tend to target. The majority of abortion facilities that dispense abortions drugs offer a two-drug combination of Mifepristone (RU 486) and Misoprostol (Cytotec), both in pill form. However 31 facilities have chosen to cut corners on the health of women by continuing to offer the outdated Methotrextate, a dangerous injectable drug originally developed for use as chemotherapy to fight cancer. It’s easy to see why disreputable abortion facilities would be tempted to roll the dice on a high failure rate in order to earn maximum profits. Early in the year, there was a palpable sense that the Abortion Cartel had not just survived the strongest effort ever made by pro-life forces to expose their wrongdoing, but had flipped the narrative and the momentum to their own favor. Undercover videos released in 2015 by the Center for Medical Progress showed ghoulish Planned Parenthood officials haggling over the price of aborted baby organs and tissue. The public shock over the revelations that abortionists were engaged in a thriving – and very illegal – underground trade in aborted baby remains created the largest scandal to hit Planned Parenthood in its 100-year history. This launched a series of investigations from Congress to Statehouses across the country. •	Supreme Court decision in Whole Women’s Health v. Hellerstedt struck down critical abortion safety laws as posing an “undue burden” in June. •	Lower court rulings were blocking the implementation of new abortion laws in state after state. •	The appearance that Hillary Clinton would win the presidential election emboldened abortion promoters. Clinton is a staunch supporter of Planned Parenthood who promised to protect them, both from criminal prosecution and Congressional efforts to defund the them. While the Hellerstedt decision had some negative impact, it resulted in only one Texas abortion facility (out of over 20 that had closed due to the challenged law) to so far reopen. But what looked like the coming of a new golden era for the Abortion Cartel, which had been in steady decline for decades, soon slipped away with the surprise election of Donald J. Trump. This year’s static abortion facility numbers are believed to be an anomaly in the long-running trend of abortion clinic closures. There is every reason to believe the Abortion Cartel will continue to decline under the new Trump Administration, which has already named several staunch pro-life supporters as cabinet members and advisors. Trump has also promised to appoint pro-life Supreme Court justices that will flip the court to one that is more favorable to life issues. Congress, which should implement Trump’s agenda, remains under Republican control, making the passage of pro-life laws at the Federal level now possible. New laws, such as the defunding of Planned Parenthood and the protection of babies after 20 weeks gestation that can feel pain, are expected to be passed quickly next year. Those two laws alone have the potential to dramatically impact all Planned Parenthood abortion facilities as well as the 162 surgical abortion clinics that currently conduct lucrative abortions at 20 weeks gestation or later. In addition, Republicans, which tend to be more pro-life than Democrats, now control both houses of state legislatures in 32 states. This will create new opportunities to reign in the predatory abortion businesses at the state level. In comparison, pro-abortion Democrats only control statehouses in five states: California, Delaware, Hawaii, Oregon and Rhode Island. Another recent development that could impact the number of abortion facilities in the future was the referral of several abortion businesses for criminal prosecution by the House Select Panel on Infant Lives and the Senate Judiciary Committee. With a new administration will come changes at the top of the Department of Justice that could finally make criminal prosecutions for the illegal trafficking of aborted baby remains a reality. This could also impact Planned Parenthood’s ability to target new areas for abortion. These developments, along with news that abortion numbers have decreased to their lowest since Roe. v. Wade — and continue to drop across America — have made Operation Rescue’s Troy Newman optimistic about the future.